PJ—affectionately nicknamed after Mrs. Paul June Tanner, landowner of the Dana Quarry at Ten Sleep, Washakie County, Wyoming where the specimen was unearthed—is approximately 70% complete, with a complete set of hips and shoulders, sections of the spine and tail, and most of the limbs. The freestanding mounted skeleton may reach up to 70 feet (20+ meters) in length and will rank as one of the finest articulated dinosaur mounts in existence. Articulation will be professionally done with custom metal working and base and will have the flexibility to be remounted or modified to satisfy exhibition space requirements. Many osteological features of this specimen are absolutely unique. First, almost all of the bones of this specimen are exceptionally well preserved, uncrushed, and flaunts a rich blackish brown patina. Parts of the skull and several isolated teeth were recovered along with semi-articulated pelvic bones and hind limbs that were preserved in very good condition. 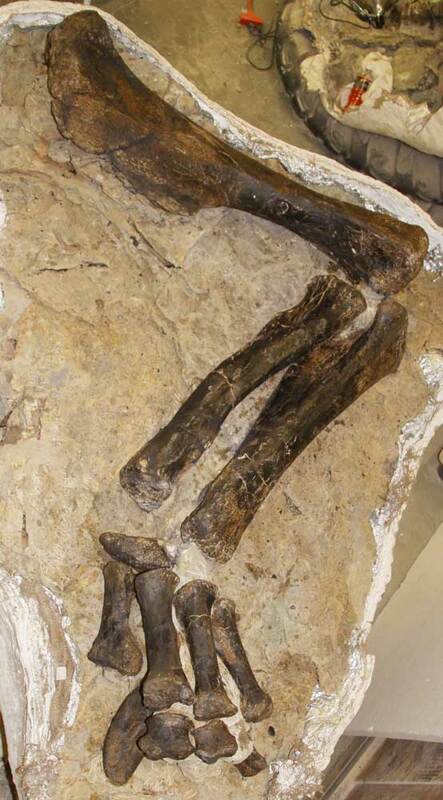 Second, complete sets of foot bones and claws were found—making PJ the only diplodocid known with perfectly preserved fore and hind feet directly associated with its skeleton. This anomaly is in high contrast to the composited mounts currently exhibited in museums—which are created from several specimens, often from different localities. The opportunity to study and compare other Jurassic Diplodocids with these ankle and wrist bones is invaluable. Third, the importance of acquiring PJ lies in its association with the other specimens from the same locality of the Dana Quarry that been purchased by numerous institutions located in Singapore, Copenhagen, and Mexico. Located at the western edge of the Bighorn Mountains and discovered more than sixteen years ago, the Dana Quarry* is an important paleontological locality that preserved an enormous multi-species death assemblage of dinosaurs. The completeness of the specimens that are discovered in Dana Quarry give any institution or museum an amazing opportunity to thoroughly study both the dinosaurs’ osteology and taxonomy. Also its diverse fossilized fauna and flora are relevant in elucidating Morrison dinosaur paleoecology and biostratigraphy. And ultimately, Dana Quarry has the potential of being one of the best North American terrestrial Jurassic paleobiological sites, since it surpasses most in completeness and quality of the specimens. Lastly, the skeleton belonging to PJ was excavated and preserved in a manner reflecting current paleontological standards, including documentation in photographs, maps and field notes, which are available for inspection upon request. In addition to this data, letters and legal documents attesting to the ownership of the property and the fossils are provided as the complete offering. Download the PJ pdf here.